Be the Big Fish in a Lil Pond with a low cost of living and Great Cash Flow! Have you been looking for an Opportunity where you "run the business" instead of the business running you? This is it and was set up that way from the start !! WANT TO GET-A-WAY: Beautiful Town Located in gorgeous Northern California Coast, where the huge redwoods meet the sea, these two profitable Sandwich shops businesses are easy to operate and learn for those who want to get into the food service business and even better for those who have the experience. These are absentee/remotely operated businesses, well run, with a long history of profits and consistent annual sales. But a working owner will certainly improve the profits even more. ONLY 20% DOWN: SBA Loan is available for these stores as they have good tax returns showing great income. So all you need is 20% down, good credit and experience. Here is your chance to live in a beautiful location you've always dreamed about and make a very comfortable living with about $109,893 working owner cash flow. These are true turn-key operations with ten years behind them and you can learn the business through not only the owner, but also the managers operating the businesses. All the hard work has already been done and ready for you to take-over. MANGERS IN PLACE: Each location has a manager and the stores are only a few miles from each other. This is a great opportunity for someone who does not want to reinvent the wheel, or is an experienced operator to take this proven concept to the next level. You can expand the operating hours to include a breakfast menu as well as adding a beer and wine license to increase sales revenues. Systems: The owner set these Fully Equipped restaurants up right several years ago, while having time to raise the kids, pick them up from school and not have to worry. The owner being in the food service industry setup the main protein source to be of a high quality with volume purchasing ability and huge costs savings. That means of course Customers love the quality while the owner reaps the cost benefits....this is a highly successful arrangement that a new owner can benefit from. There is also state of the art POS systems in place to manage & control costs, " Food, employees and more. The POS also allows the owner to see reports remotely from home or a far including menu changes, daily sales even watch the staff enter a transaction. Expand this Great concept.....and go Big or Stay as is with a wonderful lifestyle and cash flow! The owner also has a great marketing system including all the social media hookups, university food card program, local advertising and online ordering and delivery!. The seller states that the cash flow from this business allowed their family many financial and lifestyle opportunities that can now be yours...don't miss this one...they don't come along like this to often! The owner will happily train a perspective owner for continued Success! GREAT TRAFFIC: The diverse clientele draws from heavy University traffic, local business and residential community, and a significant tourist trade. 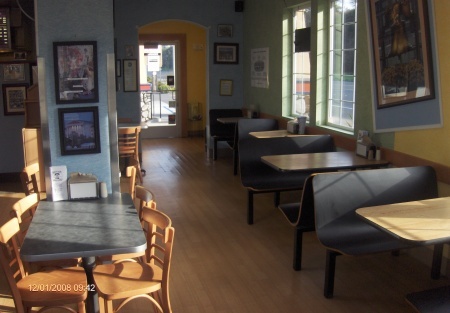 Both locations are wheelchair accessible with ADA restrooms, ample parking, excellent visibility and access offering indoor as well as outdoor dining areas. Lease Expiration: Oct 2013 and April 2012 Lease Option: 5 years / 3 x 5 years | Yearly Adjustment: 1% | Security Deposits: $3,585 and $1,300 respectively. FINANCIALS: 2012 Revenue: was $683,000 for two stores with an Owner's Cash Flow of: $109,893. Increase this sales/net as an owner operator! When the seller ran the operation daily....labor was down and sales were up. The adjusted net as owner operator on a daily basis was pereviusly up over $130,000! Detailed financials will be made available to qualified buyers. REASON FOR SELLING: The Seller lives in Southern California and runs the restaurants absentee/remotely, but does visit the stores about every 6 weeks. Seller has other business interests in So. Cal that require his attention.